It was another record year for StFX’s annual Student Research Day—now in its 16th year—with over 100 student research posters and presentations showcased March 28 in the Oland Centre Auxiliary Gym. 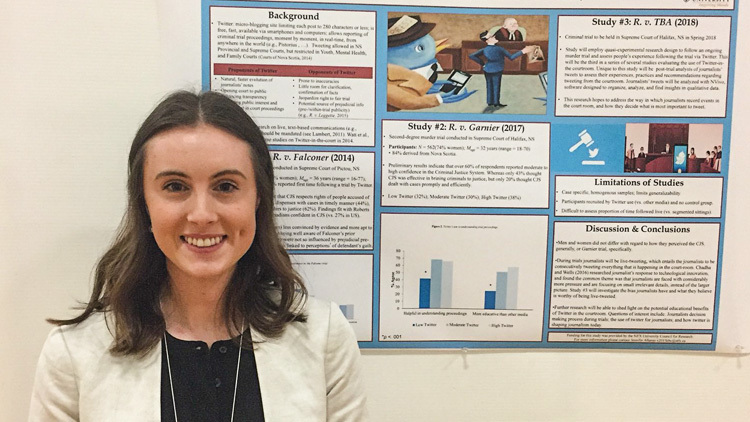 “I am delighted,” organizer and human kinetics professor Dr. Angie Kolen said on the all-time high participation, which included a phenomenal 92 poster presentations and nine oral presentations, from 17 different departments in the Faculties of Arts, Science and Business. “It was impressive,” Dr. Kolen said on the event, which has continued to grow from its introduction to campus in March 2003. Again this year, the student research presented was broad, varied and impressive, running the gamut from learning if music helps with dental anxiety to Twitter on trial and social media in the courtroom, from seals and sealing policy in the Gulf of St. Lawrence to sources of groundwater methane in proximity to legacy coal mines in Nova Scotia. “StFX Student Research Day is always a special day on the annual university calendar,” says Dr. Richard Isnor, StFX Associate Vice President, Research and Graduate Studies. “The excitement and enthusiasm that comes from our students who are talking about their research helps to forge a passion that frequently influences their post-graduate careers. The high quality and diversity of these student research presentations is always impressive,” he says. Student Research Day gives students the opportunity to showcase their research or advanced studies, and other students, faculty, staff and community members a chance to learn about and discuss the work. Several format changes took place this year, including moving the event from a Thursday afternoon event to a Wednesday evening. Remaining constant, and always growing, is the enthusiasm for student research. Dr. Kolen thanked the over 30 StFX faculty and staff who assisted with the adjudicating process and everyone who helped with the event. This research is, in part, made possible by the Government of Canada Research Support Fund.